BRUNACCI - Planisfero del Globo Celeste artico Antartico. . .
BRUNACCI, F. - Planisfero del Globo Celeste artico Antartico. . .
Planisfero del Globo Celeste artico Antartico. . . - BRUNACCI, F.
Title : Planisfero del Globo Celeste artico Antartico. . ..
Map maker : BRUNACCI, F.. Description :Decorative double hemisphere chart. Text in Italian below image. From Rossi's Mercurio Geografico. Finely engraved by Mariotti, very decorative double hemisphere celestial map. 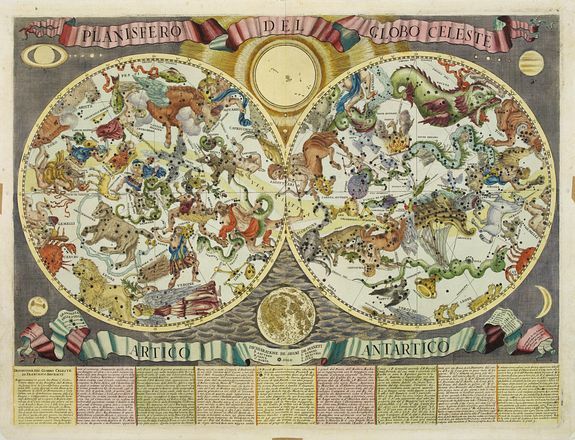 This elegantly engraved chart is based on the work of the Italian astronomer Francesco Brunacci (1640-1703), and has a descriptive panel of text below explaining the celestial systems. Condition : Paper slightly age-toned. Very good condition.